Is David Wildstein Chris Christies Sworn Enemy, or His Mini-Me? Is David Wildstein Chris Christie’s Sworn Enemy, or His Mini-Me? Chris Christie’s political office is ordinarily one of the most disciplined and effective machines in the country. But last Friday, the governor’s operation seemed to lose its compass, as it launched an oddly nasty, personal attack on the former Christie appointee David Wildstein, a central figure in the Bridgegate scandal. Earlier that day, Wildstein’s attorney had seemed to suggest that his client, who had already provided 900 documents to a legislative committee, had additional evidence that would prove that Christie had known that his team had been responsible for closing lanes on the George Washington Bridge in September, in the midst of the crisis, rather than much later, in December, as the governor has insisted. Even so, the Christie operation’s response was both out of proportion and uncharacteristically ineffectual. The smear came in the form of a memo that Christie’s team circulated to supporters and then leaked to Politico. No one within the Christie camp claimed authorship of the memo: Paul Barrett of Bloomberg Businessweek suggested it might have been the governor himself, though on Christie’s monthly radio broadcast last night, he declined the chance to denounce Wildstein further, emphasizing instead that the investigation ought to run its course. But the anti-Wildstein memo reads as a hasty oppo-research dump against a man who just recently had been a Christie loyalist and ally. In an effort to find damning material on Wildstein, the Christie memo collated a few nasty quotes from political opponents over the years (Wildstein, in the words of these opponents, had been a “political animal” who “frightened people”) and some testimony about his “tumultuous” persona and self-promoting tendencies, and then, strangely, threw in the note that “[Wildstein] was publicly accused by his high-school social-studies teacher of deceptive behavior.” All of this seemed like pretty tame stuff. More importantly, every incident on the Christie team’s list fell into one of two categories: Either Christie himself knew about it before he appointed Wildstein to be his man at the Port Authority, or Wildstein had done it on Christie’s behalf. The memo mentioned that Wildstein had been an pseudonymous gadfly blogger named Wally Edge, as if this were a damning revelation — but it turned out that Christie himself, as U.S. Attorney, had been one of Wally Edge’s most frequent sources. The whole memo was “goofy,” in the judgment of Slate. It was goofy. But it also revealed a paradox. In its efforts to make David Wildstein the plausible source of the whole Bridgegate episode (the Christie memo at one point, almost in passing, suggested the entire plot had been “David Wildstein’s scheme”), Christie’s advisors had to present evidence that Wildstein was an ambitious and aggressive political infighter. But nearly all the evidence of Wildstein’s deviousness that Christie’s aides could supply had either been implicitly endorsed by the governor’s office (in its nomination of Wildstein) or explicitly approved by its senior figures. The more Christie’s camp tried to prove that Wildstein was a nefarious actor and a lone ranger, the more it sounded like he had done his job in exactly the way the governor wanted, and the more he came to seem like a Christie mini-me. Wildstein has always seemed the likeliest scapegoat — he was more junior than either Christie’s former deputy chief of staff Bridget Kelly (fired) or campaign manager Bill Stepian (forced to resign), and further from the governor’s inner circle. During the long January 9 press conference he called to address the growing scandal, Governor Christie took particular pains to distance himself from Wildstein. There had been a lot of talk suggesting that he and Wildstein were old high-school friends, Christie said, as if their history conveyed some intimacy — but that hadn’t been the case, he insisted. “David I did not travel in the same circles in high school. You know I was the class president and athlete. I don’t know what” — a little pause here — “David was doing during that period in time.” They had been, in other words, as distant as jock and nerd could be. And yet when the Christie camp circulated its memo on Friday, it was hard not to notice that the way the governor’s team describes Wildstein is very similar to the way Christie’s political opponents describe the governor. The Christie camp denounced Wildstein for “a controversial tenure as Mayor of Livingston,” in the late eighties; a few years later, Christie himself had a similarly plagued stint as a Morris County Freeholder, that ended with lawsuits and Christie’s own party recruiting another Republican to run against him. The Christie camp suggested that Wildstein had been singularly focused on his political career from an early age (“As a 16-year old kid, he sued over a local school board election”), but Christie too was handing out flyers for local candidates and running for the student-body presidency of the University of Delaware when he was just out of his teens. The Christie camp described Wildstein, a little oddly, as “tumultuous;” there is no more singular figure of tumult in American politics than the Governor himself. In some cases, the analogy between Christie and Wildstein is even more direct. Most of the recent Wildstein misbehaviors that the Christie campaign circulated were sourced to a single 2012 Bergen Record article: “Ex-Blogger Is Governor Christie’s Eyes, Ears Inside the Port Authority.” In it, the governor’s political opponents attack Wildstein for aggressively imposing the statehouse agenda — these are the quotes that the Christie camp would in its 2014 memo cite in its denunciations of Wildstein. (“He became the watcher for the entire agency — what he was watching for was strict adherence to the Christie agenda,” one says.) But that same 2012 article quotes senior Christie figures defending Wildstein: “If he isn’t liked for that role, and if he’s accused of being zealous in that regard, then we plead guilty,” the Governor’s spokesman Michael Drewniak told the Record then. In 2012, the Governor’s team was willing to own Wildstein’s aggressiveness; in 2014, it tried to use the very same incidents to denounce him. We don’t yet know what the New Jersey legislature will find in its investigation. Perhaps, as Wildstein’s lawyer suggested, there will be evidence that Christie knew his team was punitively shutting down roads under the guise of a traffic study; more likely, there will not. But even so, the story’s burrowing action, as it has moved more deeply within the administration, has served as a rare probe into the Christie culture. The governor — never an ideologue, too iconoclastic to commit himself to representing any movement or wing of his party — has always depended a little more than most politicians on a cult of personality. The more we learn through the Bridgegate episode (the lane closings themselves, the vengeful way Christie’s aides carried them out, and now too, both Wildstein’s background and the aggression with which the Christie operation worked to smear him), the harder it seems for Christie to distance himself from the work of his own aides, to call it “David Wildstein’s scheme,” and be done with it. His aides just look and act a bit too much like him. 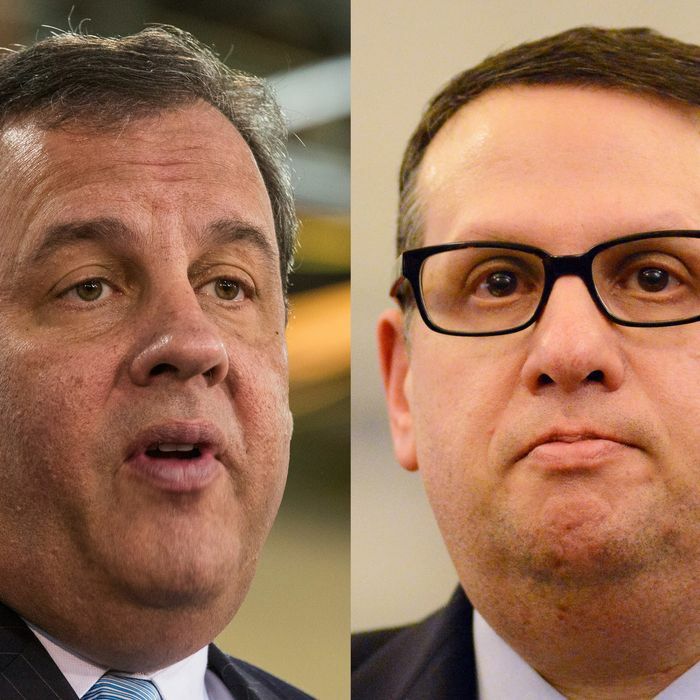 Is David Wildstein Chris Christie’s Mini-Me?